By D Magazine | 4 years ago Whether you’re paleo, vegan, gluten-free, or simply just hungry, we have the skinny on smart and delicious dining. By Nancy Nichols | 4 years ago For 18 years, I have made my living as a dining critic. The past three have been torture, as a series of strange maladies wracked my body. At one point, I could barely get out of bed. Then I figured out what was making me sick: food. By Liz Johnstone | 4 years ago From a stylist with his own hashtag to a karaoke-singing supervillain, we present our annual list of 10 people who make Dallas their runway. By Lauren Delozier, Liz Johnstone, S. Holland Murphy, Staci Parks, Jenna Peck | 4 years ago 27 men and women who routinely go beyond their job descriptions to make North Texas a healthier place to live. By Peter Simek | 4 years ago Patrick Kennedy moved to Dallas a decade ago because it was the most sprawling, car-centric city he could find. He had a bunch of crazy ideas about urban planning and no car. Now every player in town wants to hear what he has to say. By Nancy Nichols | 4 years ago If your neighborhood restaurant hasn’t adjusted its cooking to meet your dietary needs, check out these places that cater to people who take an active interest in ingredients, cooking methods, and living just a tad bit better. By D Magazine | 4 years ago Three tasty recipes for these nutritious ingredients. By Nancy Nichols | 4 years ago North Texas is full of delicious options for herbivores. It’s time to transcend plain salads and steamed rabbit food. By Nancy Nichols | 4 years ago Because vegetarians need a burger sometimes, too. By D Magazine | 4 years ago Your guide to enjoying seasonal fruits and vegetables at their best. By D Magazine | 4 years ago Craving a treat but have dietary restrictions? These will satisfy. By Bradford Pearson | 4 years ago It’s easy to find organic produce and almond milk. But what about live rabbits or a kombucha bar? Bring your own bag to these stores. By Staci Parks | 4 years ago Your guide to finding great local fruits and vegetables. By Raya Ramsey Rockwood | 4 years ago Veg out with these liquid meals. 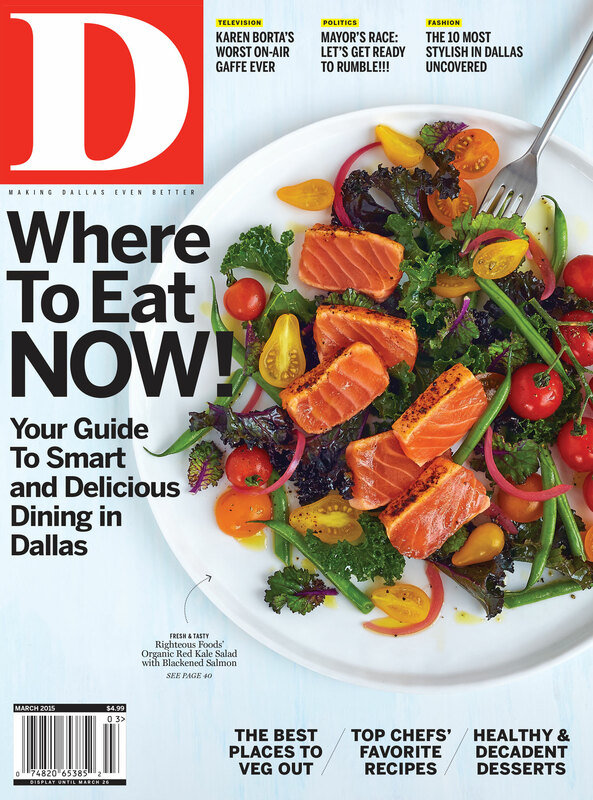 By Nancy Nichols | 4 years ago The number of Dallas diners watching their weight, eating for a medical condition, or looking for fresh, whole foods prepared for takeout is growing faster than the list of buzzwords to describe them. By D Magazine | 4 years ago Congratulations to all the worthy nominees for our fourth annual awards. By Bradford Pearson | 4 years ago He's become one of Dallas' most recognizable artists. What Happened to Dallas Police Reports? By Bradford Pearson | 4 years ago Until last summer, the city had one of the better systems in the country for accessing crime information. By Tim Rogers | 4 years ago After 20 years at CBS 11, she left the nighttime newscast to anchor the early hours. By Dan Koller | 4 years ago The high school is known for its football team, but its best squad may actually be a bunch of fishermen. Can Marcos Ronquillo Win the Dallas Mayor’s Race? By Eric Celeste | 4 years ago He says he has a puncher’s chance against incumbent Mike Rawlings. Why doesn’t anyone believe him? By Margaux Anbouba | 4 years ago They're the stylish duo behind Bows and Arrows. By Raya Ramsey Rockwood | 4 years ago Jeweler Joanne Teichman is right at home in this hot retail area. By Eve Hill-Agnus | 4 years ago This newcomer takes diners to all corners of the Mediterranean. By Todd Johnson | 4 years ago Find Tuscan warmth in the heart of Frisco. By Nancy Nichols | 4 years ago Mico Rodriguez's latest Tex-Mex offering with an American accent. By Bradford Pearson | 4 years ago This bar remains a bright light on the eastern side of White Rock. By Tara Nieuwesteeg | 4 years ago This Greenville Avenue spot had been many other bars before—including this one. By Tim Rogers | 4 years ago A book club guide to the reality TV star's memoir.